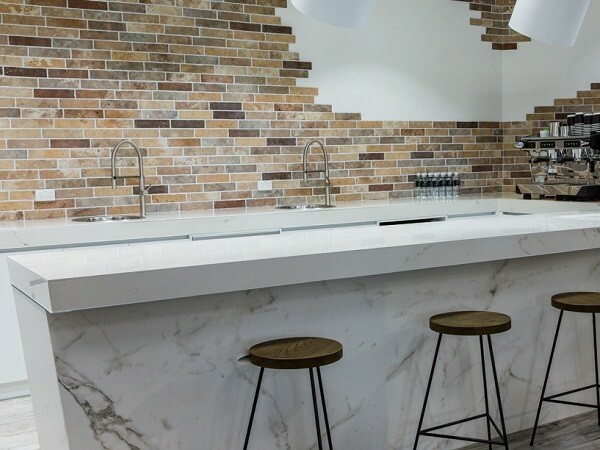 A carefully selected range of tiles has been installed on the kitchen wall of the Studio Cafe in Fortitude Valley in a seemingly random pattern with a stunning effect. The raw imperfections of the tiles lend a unique charm with the texture of the Tribeca brick tiles on the walls strikingly juxtaposed against the Estatuario marble slab on the kitchen counter. Products from Beaumont Tiles used in the application include Vintage Wood Bianco Glazed Porcelain 200x1200mm; Tribeca Mud Brick GL-Porc Txt 60x250mm; Tribeca Grey Brick GL-Porc 60x250mm; Tribeca Multicolour Brick GL-Porc Txt 60x250mm; Tribeca Old Red Brick GL-Porc Txt 60x250mm; Tribeca Sand Brick GL-Porc Txt 60x250mm; Minimo Estatuario GL-Porc Polished 5.6mm 1000x3000mm; Minimo Estatuario GL-Porc Matt 3.5mm 1000x3000mm; Tribeca Multicolour Brick GL-Porc Txt 60x250mm; and Vintage Wood Bianco Glazed Porcelain 200x1200mm.